Mustachio Salon Skins will give your customers a little mustache inspiration, or a good chuckle, while wrapped around your Barbicide jar. 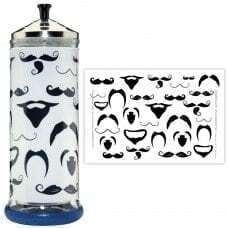 You can bring the mustache trend right to your work station when you choose the Mustachio Barbicide jar cover. This wrap fits perfectly on large Barbicide disinfectant jars.